If you can print, you can fax. FaxTalk includes a virtual fax printer so you can fax any document from any Windows application by printing or attaching documents. Use any Microsoft Windows compatible scanner to scan and fax paper documents. Use the included Fax Viewer to add annotations, signatures, logos and graphics to your faxes. View, Print, Delete and Forward your faxes by e-mail or fax. Keep a detailed log of your fax transmissions. With any MAPI32 compatible e-mail application, automatically have any incoming fax converted to PDF and send to your e-mail. Save your received faxes and messages to DropBox, Google Drive, OneDrive and others automatically. Print only the faxes you want, or automatically print them as they are received. Schedule your faxes during the day, overnight or send them during specific off-peak hours only. Preview fax documents before sending and add annotations, rearrange pages, delete pages and verify the appearance of the fax document. Send individual faxes or group fax broadcasts. No page limits, no country restrictions. 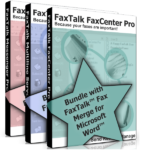 Use the optional FaxTalk Fax Merge for Microsoft Word add-on to send personalized fax merges. Create multiple custom cover sheets with your logo. Add graphics and personalized text fields. Create multiple phone books with groups. Import phone books from Comma Separated Values (CSV) files and WinFax PRO. Link Microsoft Outlook and Windows Address Book (WAB) contacts. The junk fax feature allows you to block unwanted faxes from being received. Ready to be used with the optional FaxTalk Multiline Server for local network fax and phone book sharing. With the Distinctive Ring service from your phone company and a compatible fax modem, you can have FaxTalk only answer calls for a specific ring pattern. Third-party applications are available to enhance the features of FaxTalk software. Integrate FaxTalk directly with Microsoft Word, or Sage ACT! with optional add-ons. Send faxes from any Windows application by printing to fax. Combine multiple documents into a single fax. Scan paper documents into your computer and fax it. Create a customized cover sheet for your faxes. Schedule faxes for a future date and time, or during a specific time period. Add a logo, signature or stamp to a fax page. Keep of record of all your fax transmissions with the Sent Items folder and transaction log. Option to print a send confirmation page after sending a fax. Uses your existing telephone or fax line. Receive faxes in the background while you work. Support for Caller ID service from your phone company. Support for Distinctive Ring (Ident-A-Call) service from your phone company. Automatically forward received faxes to your e-mail address. Receive notifications on screen or e-mail when you receive a fax. Block unwanted junk faxes with the Junk Fax filter. Option to automatically print faxes as they are received. Keep a log record of all your received faxes in the Inbox folder. View faxes using the included Fax Viewer and print them. Print faxes automatically upon receipt. Rotate fax pages received sideways or upside down. Edit faxes you receive by adding comments, annotations etc. Store and organize often used fax attachments in the FaxTalk File Cabinet. Create unlimited contacts for storing addresses and numbers. Create fax groups for easy fax sending to multiple recipients. Link your Outlook and Windows Address Book (WAB) contacts. Search, edit and modify contacts. Import WinFax PRO phone books and faxes into FaxTalk. Voice answering with FaxTalk Messenger Pro and FaxTalk Multiline Server. Add Telemarketing call block tones when answering a call. Record custom greetings for each mailbox. Create a voice notification rule to notify you of new faxes or voice mail. Create a fax on demand (FOD) system. Record Caller ID information for each call. Route calls based on Distinctive Ring service from your phone company. Built in extensive Help Topics feature. Answer calls based on a schedule. Super G3 Fax Support when using a compatible Super G3 fax modem. Support for Caller ID and Distinctive Ring services from your phone company. Automatic e-mail forwarding of received faxes with a supported MAPI32 e-mail client. Convert faxes to PDF or TIFF images. Automatically save received faxes to the location of your choice. Support for optional third-party applications, such as Sage ACT! mail merge+ and Microsoft Word mail merge*. Software Development Kit (SDK) available to add faxing in your custom application. Advanced Network Fax Sharing when using FaxTalk Multiline Server and optional FaxTalk clients. Connect to the FaxTalk Multiline Server with optional FaxTalk clients on your local network. Share common phone books with each connected FaxTalk client on your local network. Send and Receive faxes from connected FaxTalk clients with no additional telephone connections or fax modem hardware. View received faxes using FaxTalk clients. Support for sending and receiving using up to 8 fax modems.